The Delhi Dehradun express stops for long time at various places and reaches Dehradun by 9 in the morning. We woke up by the time the train reached Haridwar and saw dried Ganga on the way. At Dehradun railway station, you can walk outside to the Dehradun bus stand where there are half hourly buses to Mussoorie from 6 in the morning to 9 in the night. We walked further, had breakfast, and walked through the market to reach clock tower. From the clock tower a small bus took us to Forest Research Institute at ₹10. There were a couple of other tourists waiting in the electric cart at the entrance. We quickly bought entry tickets and sat on it. I was at the tail, looking back when the cart went forward. The straight road cut at right angles to several buildings, all in lush green plots. 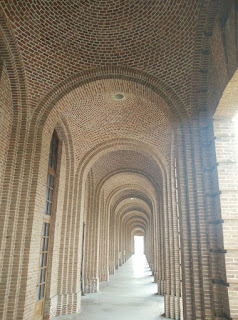 The cart dropped us at one end of a large, imperial building built of red bricks. 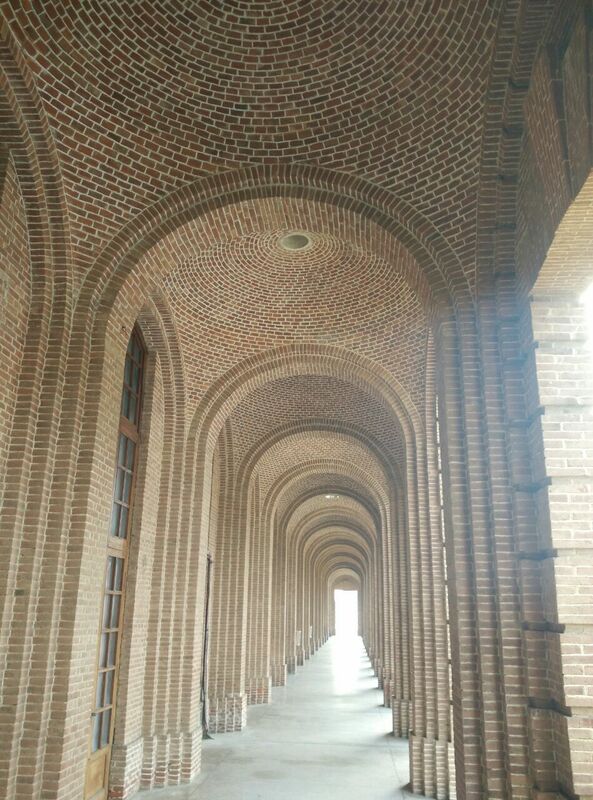 This was the Forest Research Institute. Some of the corridors reminded us of Hogwarts. There were multiple "exhibitions" inside the building. The entry ticket would cover all of them. But the exhibitions were rather the various departments of the Forest Research Institute. For example, there was this pathology exhibition, in which the pathophysiology of all the plant diseases were shown (with pathological specimens just like our medical college). Siviculture exhibition was about cultivating forests and there were tiny models of forests showing how the trees looked at different height. In another room, there were cross sections of 800 year old trees showing tree rings that corresponded to different years in the history. One of these rooms, I heard about cordyceps sinensis which is a fungus that parasitically grows out of worms apparently more expensive than gold and extremely difficult to procure. A nearby school had come for picnic there and when we got outside the Institute's garden was full of kids playing different games in their own little groups. This is also where our Russian friend saw someone posing in one of the classic Bollywood hero poses and imitated those himself. We started walking back and got on to the electric cart about a minute down the path. Then we took a vehicle back to the Dehradun city back to where we started from. At the bus stand, there were regular and frequent buses to Mussoorie. All we had to do was stand in queue and reserve seats in the next bus that was going up. The ride is just under a couple of hours but the road is winding and uphill.